Dubai: If Syrian composer Khalil Ghadri were to be granted one wish, it would be reflective of every other Syrian’s desire — for peace to be restored in their country. 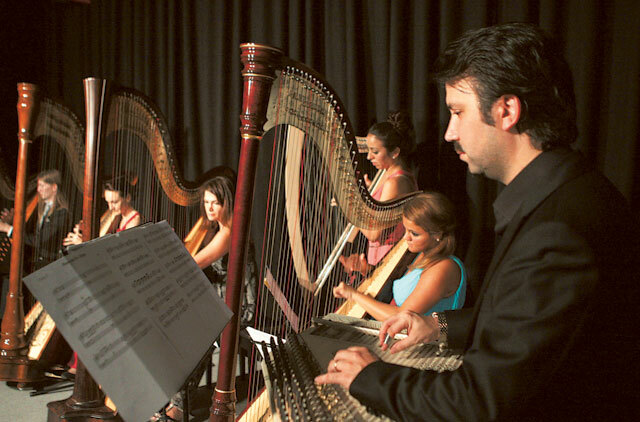 That was why for one hour on Sunday night, Ghadri and five Dubai harpists played the harp at The Fridge with the hope of spreading peace through music and in remembrance of the innocent children, women, and civilians who were caught in the crossfire or killed in strife-torn Syria. Now in its third year, Peace Hour 2012 is a global event wherein harpists around the globe played the harp for one hour to reflect on the costly side of wars and conflicts. The event was witnessed in hundreds of cities across six continents on Sunday. For Ghadri, who plays the kanun (Arabian harp), the event was more than just a musical exhibition. It was an avenue for their music to strike a chord with their audiences as they call for global peace. “We’re doing this to let the people know that we’re playing music not only as a hobby or to entertain someone. Through our music, we can give a message for the entire world with different languages, because you know music is one language that everybody can understand,” Ghadri told Gulf News. Included in the repertoire was Syrian Tears, a song Ghadri composed a week after news of the Al Houla massacre broke out two months ago. On May 25, 116 civilians, including 55 children were slaughtered in a town called Al Houla in Syria. “That [music] represents the Al Houla children who were killed by knives. When I opened the TV, I saw really small children [who died] just by knife, not, for example, by bullet, or you’ll say it was by mistake, but by a knife!” Ghadri said in disgust. “They are not chicken. Even for me, when someone kills a chicken, I will find it strange. But [to kill] children, that was not only [an act of a person] without a heart; those people may be from a different planet,” he added. For the first time since 2009, four concert harps and one kanun took centre stage at a jam-packed The Fridge. Lidia Stankulova, a professional harpist who organised Peace Hour 2012 in Dubai, dedicated the event to all the Syrians in the emirate. “We have a lot of Syrian friends here, we care about them and about the previous problems of different countries. We all have friends from this region. This is dedicated to all the Syrians,” Stankulova said.